Erika is a name that has haunted Total since 1999 and has long been a symbol of Total’s complete disregard for the environment when in pursuit of profit. In December 1999 the Erika tanker, commissioned by Total, split in two near the coast of France, spilling 10 million litres of oil into the ocean , killing over 100 000 birds (the biggest ever ecological disaster for Europe’s sea birds), destroying sea life and polluting over 500km of coast line. Whilst civilians, soldiers, wildlife agencies and foreign aid flooded in to help save the birds and coastline, the finger of blame was pointed at Total for their appallingly lax safety standards. 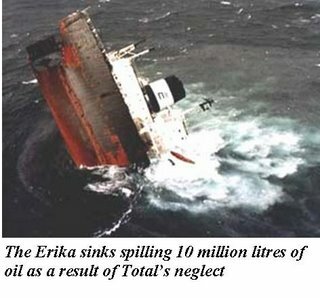 An enquiry following the disaster revealed that Total was guilty of negligence in the vetting of the Erika, something that they were responsible for having commissioned the vessel to carry their oil. Lucien Bekourian, one of the commission’s experts, said the quality of Total's vetting was "clearly behind similar control processes in other companies". Bekourian said that Total used the Erika despite warnings about the quality of the ship. Total, in typical style responded with a weak claim that there were no international standards on vetting and they therefore did not bare responsibility. The backlash revolved around a massive French-based campaign to boycott Total –the largest campaign of its sort before Total invested in Burma. 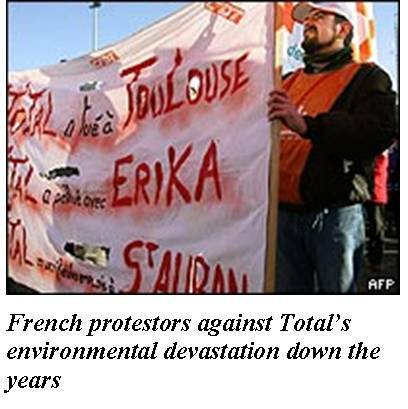 Environmentalists from France and further a field, many who had been involved in the enormous clean-up in the wake of Erika, criticised Total’s negligence and encouraged people not to buy from an oil company who wreaked such enormous devastation on Europe’s environment to save the money that would have been spent on vetting. Many still boycott Total as a result of the Erika atrocity, their resolve only strengthened by Total’s human rights abuses and environmental devastation in Burma. Total failed to recover their reputation in France as just two years later their plant near Tolouse exploded killing 31 people, wounding 3000 and leaving tens of thousands homeless. 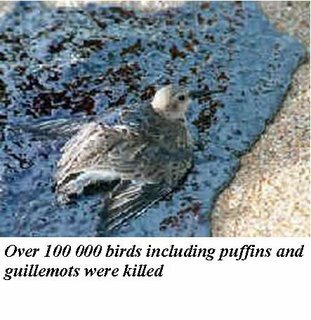 Total were subsequently found guilt of neglect in storing dangerous chemicals at the site, a further illustration of Total’s utter neglect for both people and the environment; a character it has maintained across the world. The case against Total is more complicated than one would think based on many of the media reports. Corruption among Italian businesses and the shipping industry at large were instrumental in this environmental disaster. I hope that Obama will talk about the true cost of oil. People in this country are complaining that oil gasoline costs them $4 per gallon. However, oil costs us much more. I think that the cost to the environment, which can be calculated in dollars...for example the cost to clean-up oil spills, the cost of dirty air and the health problems it causes, the costs of hurricanes like Ike and Katrina, the cost of global warming in general. I hope Obama has his people calculate these real costs and average them into the cost per gallon for gasoline. I would imagine gasoline actually costs the average citizen more like $50 a gallon! Just as an addiction to heroin costs much more than the price of the drugs itself, so addiction to oil costs much more than what we pay at the pump. What about the cost to our beautiful landscapes; the coastal waters, the pristine Alaskan environment. And what should we do with all of these ridiculous drilling rigs after we have sucked all the oil out of the ground and pumped it up into the atmosphere? What about the cost of removing the drilling machines when they are no longer of use...when all the oil is gone...because one day it will all be gone...that is its nature. Oil is non-renwable. Or do all the fanatical born again christians like Palin not care because they are just hoping for Armageddon soon anyway? The policies of the right wing christians will certainly hurry that along! OIL IS FOR DINOSAURS...and if we keep using OIL we will become dinosaurs. We need to invest in the energy of the future....in fact solar and wind power are the energies of the present. They already exist! Lets use them more fully and develop a sustainable infrastructure before the religious right (which does not care about the planet anyway) turn Earth into a living hell. It is ironic that the place where the black poison is refined is also the place where mother nature strikes hardest with the rage that oil curdles in her blood. Maybe it is mother nature saying...STOP WITH THE OIL ALREADY or I will send storms the size of states to stop it for you! Many of the biggest polluters are those who represent the supply of oil around the world. And from this, all the other consumers, whose activities are based on oil. Editorial 1: Why Total? Why now? Editorial 2: Protest! Protest! Protest!